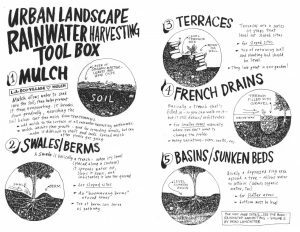 Here’s a wonderful free booklet to help you use permaculture principles to harvest rainwater and put it to use in your yard and gardens. The wonderfully-illustrated 8-page primer was created by by Joe Linton (of LA Creek Freak) to accompany a workshop he did in 2008. The guide draws heavily from Brad Landcaster’s books Rainwater Harvesting for Drylands I + II which lay out many strategies for creating lushness, shade, and food in the suburbs, using the resources at hand. It goes into how to build urbanite (broken concrete) walls, how to lay out your gardens and permaculture elements, do’s and don’ts, how to use mulch, french drains, basins, sunken beds, terraces, swales, berms, mulch, recommended reading and more. The PDF book was originally available on Scribd and seemed to disappear from the internet completely after I first found it a few years ago, but I have found it again here.